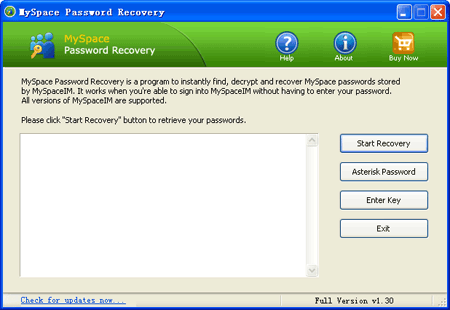 MySpace Password Recovery is a program to recover MySpace passwords stored by MySpaceIM in the local computer system. It works when you're able to sign into MySpaceIM without typing your password. Even if you have un-installed MySpaceIM, there's still a chance to recover your password. Simply install the program, launch it and find your MySpace password immediately. Recover MySpace passwords saved by MySpace IM. MySpace Password Recovery additionally includes an universal password recovery tool: Asterisk Password. It enables you to view passwords hidden behind the asterisk characters in password fields of many instant messengers, not only for MySpace IM. MySpace Password Recovery enables you to easily recover lost or forgotten Myspace login and password. When you log in MySpaceIM, you can check the "Remember My Password" tickbox to store your password on your computer. The next time you launch MySpaceIM, the password field will be automatically filled with your password, but you won't be able to view it. This is where MySpace Password Recovery comes in. You haven't logged into your MySpace IM for a while, and can't remember your password. You sign-into MySpace IM every day. The messenger logs in automatically because the password is saved on your computer. You want to login into MySpace IM on another machine but you don't remember your password anymore. You changed/reseted the password for your MySpace account but forgotten it latter. "The other day MySpaceIM suddenly crashed. Each time I opened it, it always quit unexpectedly. What was worse, I had forgotten my password completely! If I reinstall MySpaceIM, my account will be lost! MySpace Password Recovery surprisely recovers my password that is remembered by MySpaceIM. It saves me a lot of time and worries! Thanks very much!" "This program is AWESOME! I will spread the word from now on that it's worth it." "Thank you for your help! It worked like a charm. I have successfully regained access to my MySpace account." Learn How can you recover MySpace passwords easily with MySpace Password Recovery program.